The Macallan in Lalique Six Pillar Collection will finally be completed as the sixth and last masterpiece joins its five brethren when it is made available to the public for purchase in July this year. Oh, the ‘Peerless Spirit’ decanter will cost a sweet S$47,000 before GST. The prestigious collaboration collection between Scottish whisky brand The Macallan and French crystalware maker Lalique began in 2005 when the first decanter of 50 year-old whisky, celebrating The Macallan’s exceptional oak casks, was first unveiled to the public. Over the years the collection would garner much interest from moneyed collectors – according to a Whisky Magazine report, in 2014 the top ten priced bottles sold at auction were The Macallan; out of those ten, eight were decanters from The Macallan in Lalique Collection. The final decanter that will be introduced is likely to debut into such acclamation. Only 450 individually numbered decanters of the ‘Peerless Spirit’ will be released. ‘Peerless Spirit’ – like the others in the collection it’s named after a pillar of The Macallan’s brand promise – features a gorgeous crystal decanter made by Lalique in the style of René Lalique’s famed perfume bottles, and created from inspirations drawn from a previous design or specific technique from his heritage. 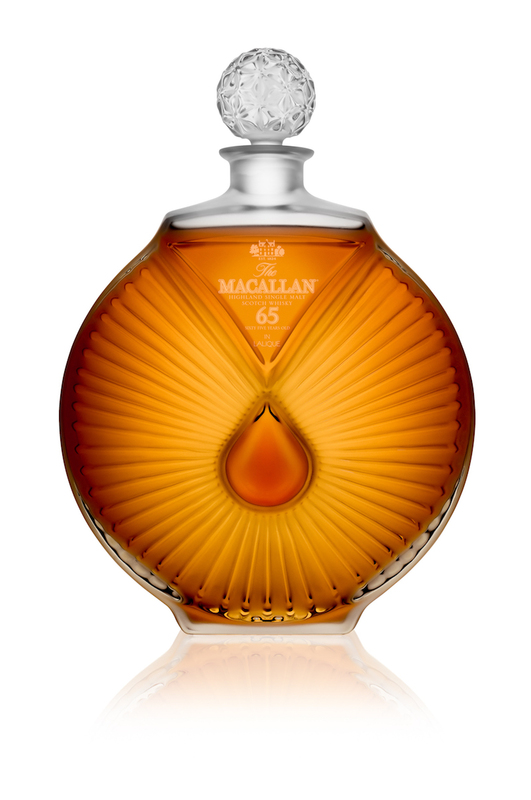 The decanter design features a teardrop falling from The Macallan’s iconic inverted triangle found on every present-day bottle of The Macallan. But for true whisky connoisseurs what matters is the liquid contained within. In the fifth release ‘The Spiritual Home’ launched in 2014 was a 62 year old whisky, and the ‘Peerless Spirit’ tops that by containing 65 year-old whisky, a colour of dark walnut from long aging in sherry casks from a time almost half a century before the Edrington Group even set its sights on buying the distillery. “This sixth and final release continues to showcase the unwavering commitment of both the masters of Lalique and The Macallan to create beautiful objet d’art,” says Ken Grier, brand director for The Macallan. “The marriage of the finest and rarest Macallan single malt whiskies with our beautiful bespoke handcrafted decanters has been a wonder to behold. We are proud to be part of this stirring journey celebrating the Six Pillars of The Macallan,” adds Silvio Denz, chairman and CEO of Lalique.